One of the hardest parts for me during pregnancy was living in the US after having lived in Israel for 14 years. The problem was that I craved Middle Eastern food, particularly kubbeh soup and I couldn’t find any kubbeh soup when I needed it. The many varieties of kubbeh soup all have a sweet and sour broth with dumplings often made of semolina (but it could be rice or bulgur) stuffed with meat (or maybe mushrooms for the vegetarians). That description should make it clear that kubbeh soup is an elixir for a pregnant woman. It may not be exactly scientific, but when you’re trying to grow another living being inside you, what could be better than starch, animal protein, and a nice hydrating broth? Back in the waning days of 1998, my craving for kubbeh soup was fierce and Mr. Dot and I spent one evening driving around LA calling the various kosher Middle Eastern restaurants on our ginormous flip phones to see if they had kubbeh soup. A now defunct hole in the wall promised to make it the next week which wasn’t quite soon enough. Somehow, I made it through that horrible night without hopping on the next flight from LAX to Tel Aviv. I have never made my own kubbeh soup because it’s one of those labor intensive things that I thought you could only make it you learned the recipe and technique from your Moroccan or Kurdish grandma. 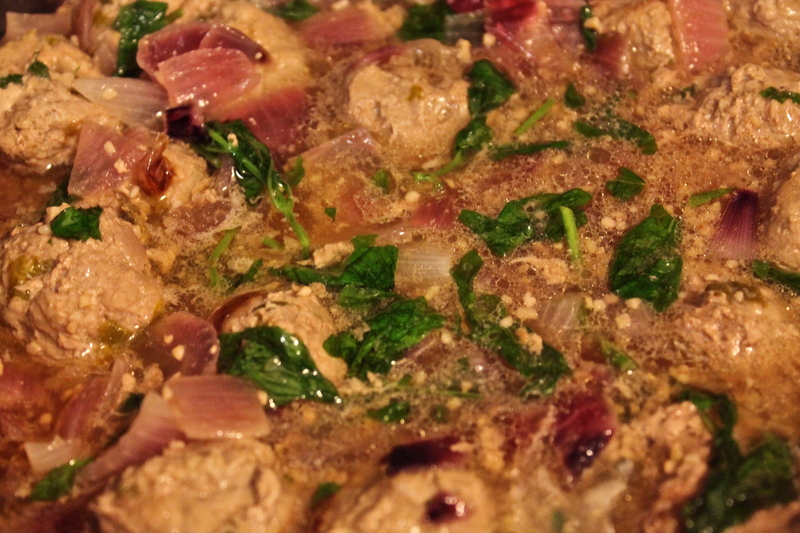 Years later I came upon the recipe for nanaeyah, in Claudia Roden’s encyclopedic Book of Jewish Food and realized I could easily get some of the tang that I love in kubbeh soup—without the kubbeh and without the soup. According to Roden, nanaeyah was considered an every day dish by her grandmother in Baghdad but I have successfully made it as a first course for an elegant meal or as hors d’oeuvres for a party. Like all dishes that I make a lot, this one has been adjusted here and there and I’m not sure if a Baghdadi grandma would recognize it (and she would definitely be contemptuous of my not even trying to make kubbeh). Even as I tinker with the recipe, it retains some of that essential sweet/sour/minty/garlicky/meaty flavor that my pregnant self sought that desperate night in LA. On a recent lazy summer night, I made a weeknight dinner version of the minty meatballs with odds and ends from my almost bare pantry. And that’s another plus of this recipe in addition to its being an easy way to get those tangy flavors: most of the ingredients are pretty easy to have on hand, especially if you grow mint in your yard (and trust me, as someone with the opposite of a green thumb, it’s very easy to grow mint in your yard). I find that they liquidy, tangy quality make this work well with ground turkey instead of beef or lamb for a lower cholesterol edge. And so, without further ado, my healthful (thanks to the turkey), scraping-the-bottom-of-the-cupboard (that’s why there’s a red onion) version of Nanaeya. Mix the turkey with salt, pepper and parsley and roll into balls the size of small walnuts. Set aside. Fry the onions in the oil until soft. Add garlic and the meatballs and cook turning meatballs to brown on all sides. Pour in water to not quite cover the meat and bring to a boil. Add pinches of salt and pepper and simmer for 25 minutes so that the sauce is reduced. You can turn the meatballs again if you think they need it. Mix the lemon juice and sugar and pour over the meatballs and then add the mint. Cook for 15 minutes more. Serve with rice. 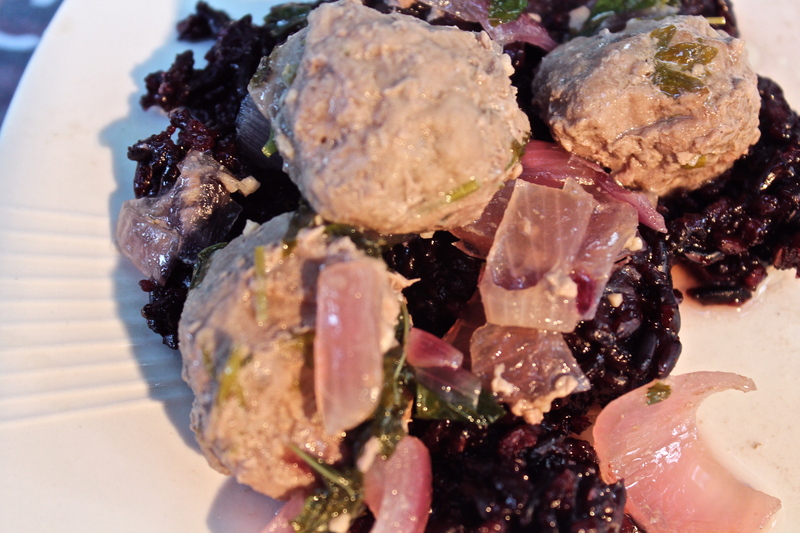 I used leftover black rice (which is purple) and a red onion because that’s all I had and while this wasn’t authentic (and I thought that cooking with it would turn it muddy brown, but it didn’t), it was delicious and beautiful. In fact, the red onion gave it a redness that beef might have had and added a little something extra that the turkey would not have had on its own. The photographer for my blog is generally about as easygoing as a teen can be. I pay her by giving her room and board, special treats and occasionally buying her some outfit that I don’t quite get but makes her really happy—like a romper. But there’s one thing she can be demanding about and that is her need to eat Indian food. There have been times when she has come home from school and smelled the aroma of something cooking on the stove and been furious because she had decided while in school that we would be going to our neighborhood vegetarian Indian restaurant, Woodlands, where they start heating up the mutter paneer and frying the paratha as soon as she crosses the threshold. Of course, I don’t always acquiesce to her demands to go to Woodlands because I run a tight ship and try not to go there more than once a week. 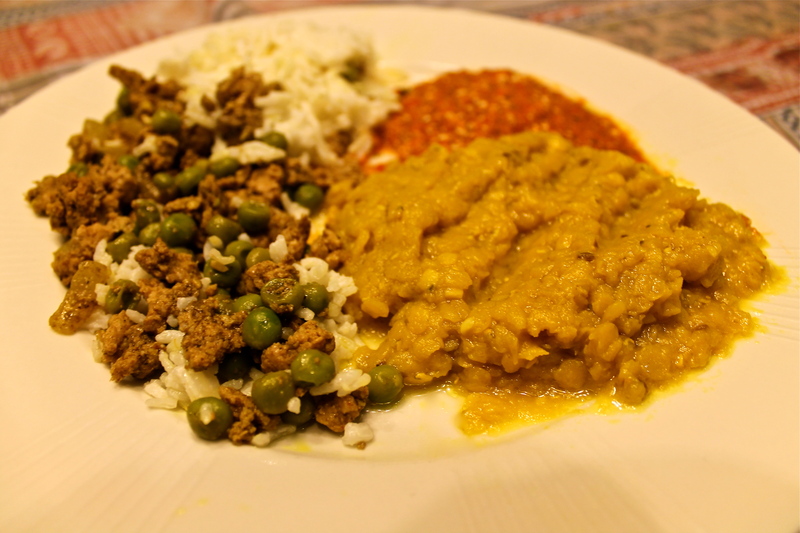 I am able to hold fast and not buy ready-made Indian food every night because I have learned how to make some pretty good substitutes at home. One cookbook that has helped me throw together an Indian meal is Madhur Jaffrey’s Quick and Easy Indian Cooking which I received as a gift from a former colleague. Jaffrey explains in this book that preparing Indian food doesn’t necessarily take a lot of time as long as you have a lot of ingredients to provide the necessary depth of flavor. This translates into having a well stocked spice cabinet. Given my love of (1) exploring the shelves at local ethnic food markets (2) cardamom and (3) my photographer, this ground turkey and peas dish is a week night staple at our house. Put the oil in a wide pan (like a chef’s pan) and set over medium-high heat. When the oil is hot, put in the cinnamon, cardamom, and bay leaves. Stir for a few seconds. Add the onion. Stir and fry until the onion pieces turn brown at the edges. Add garlic and stir for a few seconds and then add the ginger and stir for another few seconds. Then add the ground turkey and stir and cook until all the lumps are broken up and the meat browns. Then add all the remaining ingredients. Stir to mix and cook for another 2-3 minutes, stirring occasionally as you do so. Remove the bay leaves, cinnamon stick, and cardamom pods and serve. And now you have a better view of one of our fearless photographer’s all-time favorite foods: coconut rice–the possible subject of another blog post. All photos by the fearless REG. Those of my readers who aren’t entrenched in the American Jewish community may not know that Teaneck, NJ is a the Modern Orthodox mecca. Only the true cognoscenti know the real reason behind Teaneck’s success . . . MARBLE CAKE. Marble cake is THE cake to buy at Teaneck’s kosher Butterflake bakery. Every Friday, hundreds (thousands?) of these cakes fly off the shelves and once you taste one, you’ll know why: it’s a great cake that’s light, chocolaty enough without being overwhelming, and it appeals to kids but isn’t too sickenly sweet—in fact, its chiffony lightness makes it work for grownups, too. So that’s the secret: a cake that everyone loves. 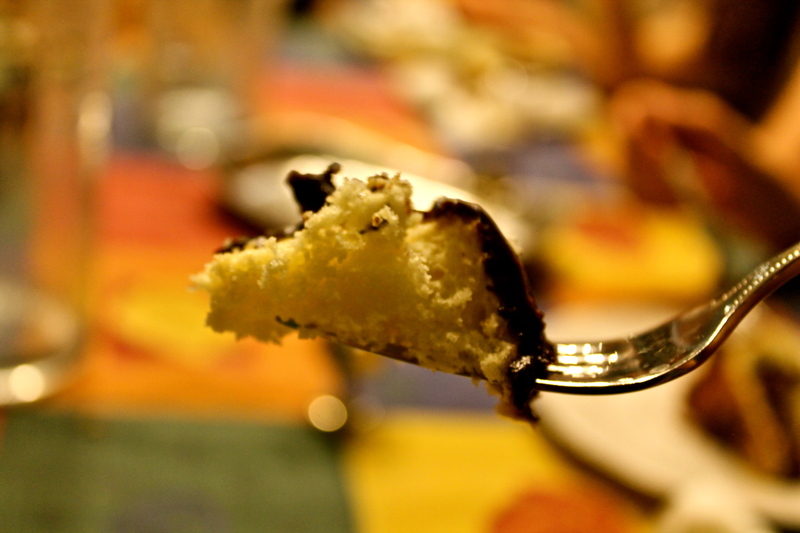 Thanks to our Teaneck relatives, we discovered Butterflake’s marble cake years ago. Our fearless photographer, REG, fell in love with this cake when she was a toddler and we’ve been importing them from Teaneck ever since. Sometimes after a visit to the cousins, we buy several cakes and freeze them for the future. There are times, however, when we have neither this ur-marble cake in the freezer nor plans to go to Teaneck. When that happens, I turn to my mother’s marble chiffon cake recipe. It’s not quite what Butterflake makes (and it may be impossible to get the consistency of Butterflake’s glaze without some additive I don’t want to know about) but it’s pretty darn close. There’s actually a disagreement in our family: My husband says this is better than the Butterflake cake but my fearless photographer votes for the bakery version. Actually, I only recently realized that both marble cakes and chiffon cakes are so passé that (like my pink-tile bathroom) they are about to come back into style. 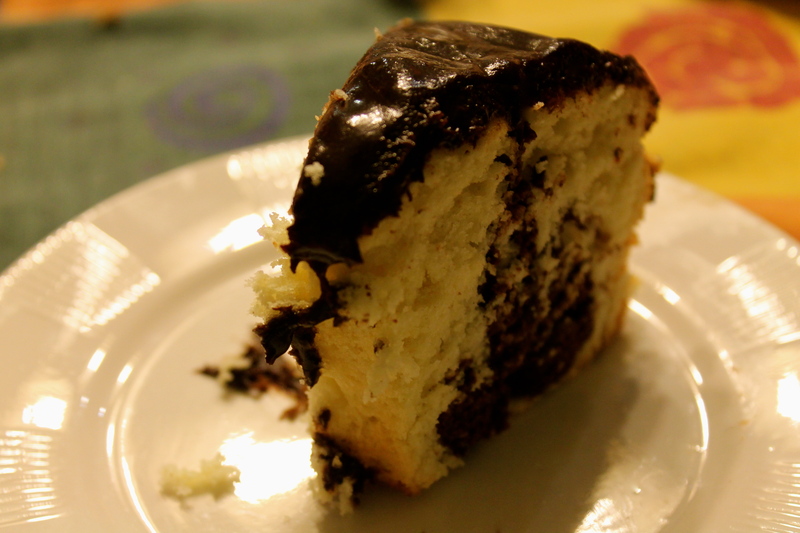 I’ve always loved the way that marble cake allows me to bypass the either/or choice of chocolate or vanilla. I also love whipping meringues into light fluffiness though I do wonder which Neanderthal woman first discovered that not only could you eat an egg, but if you separated it and beat it, it would be all light and fluffy and add height and lightness to your baking. Your bowl and utensils have to be (and this is mom’s word and I can still her it in my head) “scrupulously” clean and dry. Any foreign agent will prevent your whites from whipping. Break the eggs when they are cold. First break each egg into two glasses (one for whites, one for yolks) and then add the whites and yolks one at a time to the respective bowls of other whites and yolks. By breaking eggs that might somehow not separate properly into the small cups, you won’t accidentally introduce the dreaded foreign agent (like a pinprick sized drop of yolk) into your egg whites after you’ve already separated 10 of them. Once you have beaten your whites, gently add the other ingredients. If you are pouring a batter into the whites, lighten the batter first with some of the beaten egg whites. That way you won’t be introducing a heavy and potentially deflating mixture into your airy and fluffy whites. To properly fold ingredients into egg whites, take a large spatula and lift and fold from the bottom while turning the bowl around 90 degrees with each turn. This allows you to truly mix it all in while being gentle and not breaking up the egg whites. 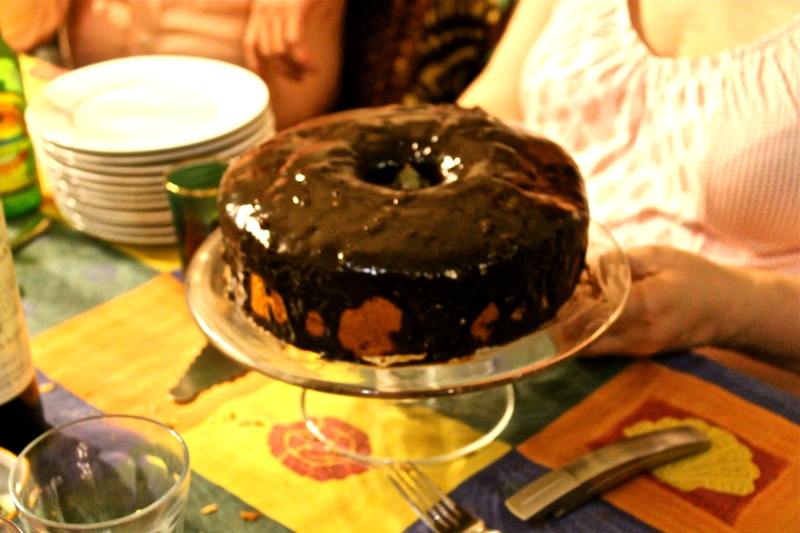 So without further ado: my mother’s marble chiffon cake recipe in all its mid-twentieth century glory. Lightly grease an angel food cake pan. 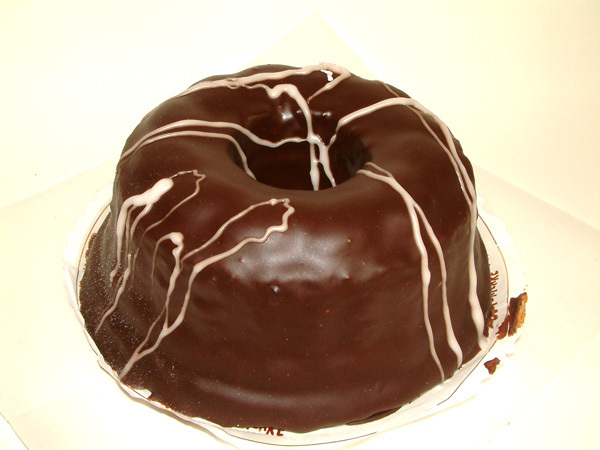 For the chocolate part of the marble cake: Mix cocoa, ¼ cup of the sugar and the hot water and set aside to cool. For the cake: Separate eggs and beat the whites gradually adding cream of tartar until stiff and dry. Put sifted flour, sugar, baking powder and salt in a bowl. Add oil, egg yolks, water, vanilla and lemon extracts and mix until smooth. Gently fold in around one cup of egg whites into this mixture and then fold the mixture gently back into the egg whites. Remove one cup of batter and add it to the cocoa mixture. Pour white batter into pan and then swirl cocoa batter into this. Bake at 325 for 55 minutes and then at 350 for another 15 minutes. Remove and cool on rack. When fairly cool, invert and then remove from pan when totally cool. When you remove it from the pan, place it on strips of wax paper so that you can dribble the glaze and then remove the mess and feast on the chocolate droppings, leaving the serving plate clean. For the glaze: Melt chocolate, vanilla, and butter/margarine in the top of a double boiler. As this mixture is melting, add the water. When it’s all blended remove from the double boiler and quickly whisk in the gently beaten egg–and do your best not to scramble the egg. Add confectioners sugar. 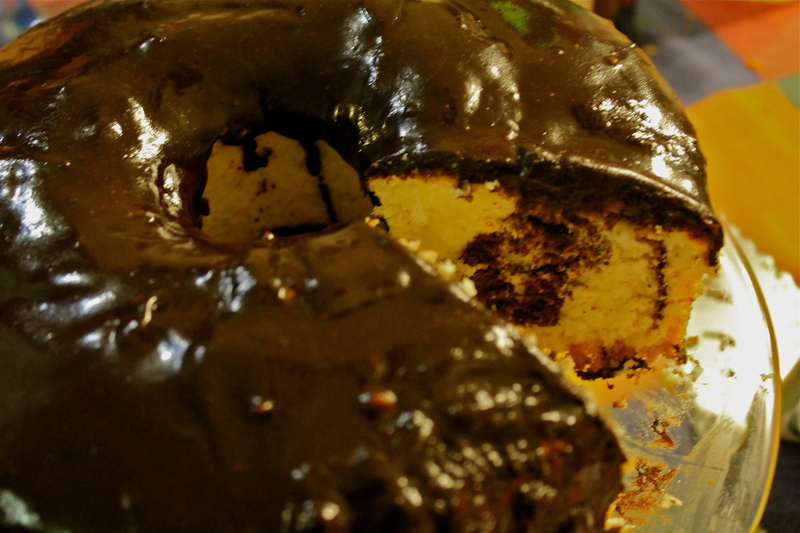 When all is encorporated and the mixture is nice and glossy, pour it over cake. You don’t have to cover the sides but there should be lots of drippings on the side. Ideally, you won’t serve this immediately and the glaze will harden a little. It’s time for another Jewish holiday, Shavuot, which begins this Tuesday night and lasts a mere two days, hardly a blip on the Jewish calendar. In fact, it’s such a blip that it’s often unknown or ignored except by people who are very Jewishly connected and/or love cheese blintzes and cheese cake, the traditional foods of this holiday for Ashkenazi Jews. Half a life ago, my bff for most Middle East adventures, Lisa T. (who will not, I promise, be mentioned in every Blue Dot post), and I made a Shavuot meal together. Only after we served savory blintzes and sweet blintzes and something else cheesy and then cheese cake for dessert, did it occur to us that our two guests were both sons of men who had died young of heart attacks. 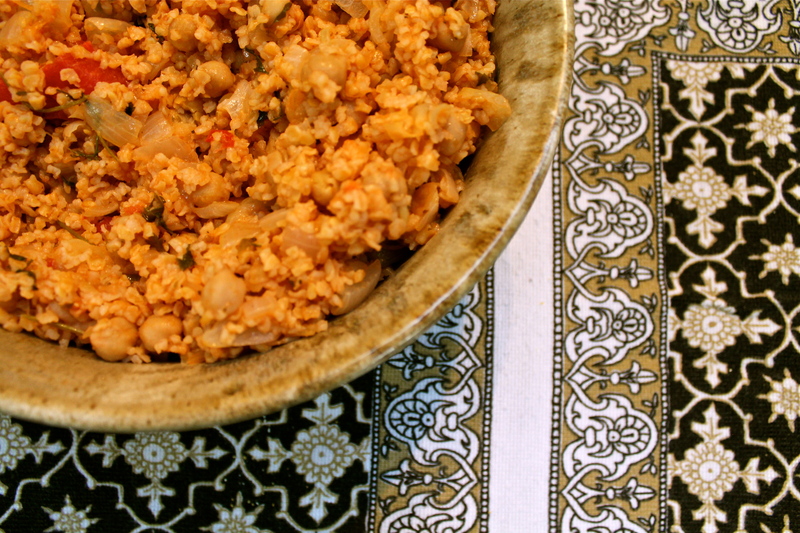 This chickpea bulgur pilaf remains my favorite wheat dish. It’s a hearty one-pot vegetarian meal , especially if served with some minty, peppery yogurt on the side. Over the years, I’ve further simplified the easy recipe I first found in Madhur Jaffrey’s great World-of-the-East Vegetarian Cooking so that it can be a quick week night meal. Jaffrey’s recipe calls for fresh tomatoes, but I use canned, a staple in my pantry, and also fresh parsley but you can use dried. Of course, you can still make a “blintz, blintz and cheese cake” meal if you like. But I’m not sure that your guests wouldn’t enjoy pilaf and then cheese cake even more. Heat oil in a large pot over medium heat. Saute chopped onion 2 minutes until soft. Add tomatoes and cook 3-4 minutes. Add drained chickpeas and parsley and cook for 10 minutes on lowish heat, stirring occasionally. 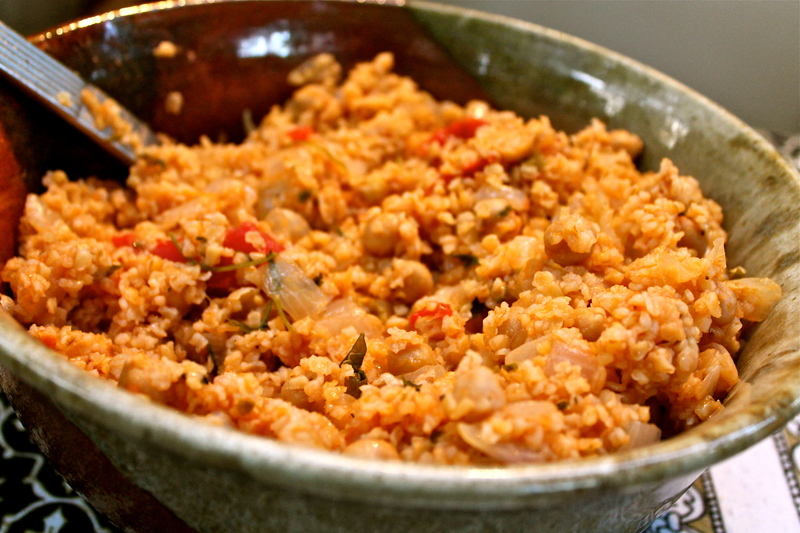 Add bulgur, one cup of water, salt and pepper and bring to a simmer. Cover and turn heat to low and simmer for 30 minutes. Turn off heat. Remove lid and cover with dish towel.